Information: By L.L. Lloyd in The Folk Dancer. 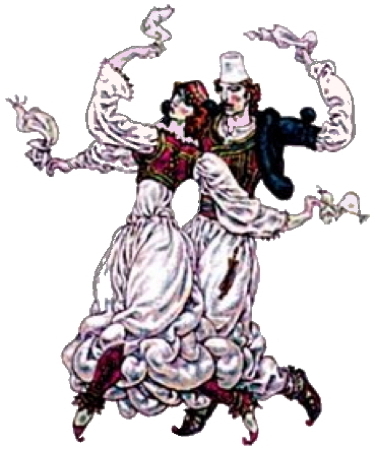 […] Two important foreign influences are noticeable in certain kinds of Albanian dances. In the town, the dancers show traces of Oriental style, for which Turkish influence is perhaps only partly responsible. In the frontier regions, one sees choreographic elements that seem to be borrowed from the neighboring Balkan countries. But in the mountain areas that comprise the greater part of the country foreign influences are hardly to be traced and generally it seems that a very ancient dance style has been preserved virtually without change. From the relatively few recordings of Albanian dance music available in the West, we know that the Albanian countryside possesses some of the most exciting as well as some of the most complex rhythms to be heard anywhere in Europe. Rhythms of 5, 7, 9, and 11 times seem almost as common in Albania as in Bulgaria. The fascinating music to be heard on record whets our appetite for a visit to Britain of authentic dance groups from Albania, a land of which far too little is known.